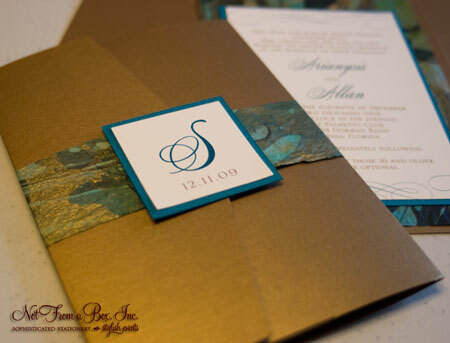 The Pocket invitation is one of our most popular styles for wedding and party invitations, so we love when clients are open to mixing in unique color and paper combinations. 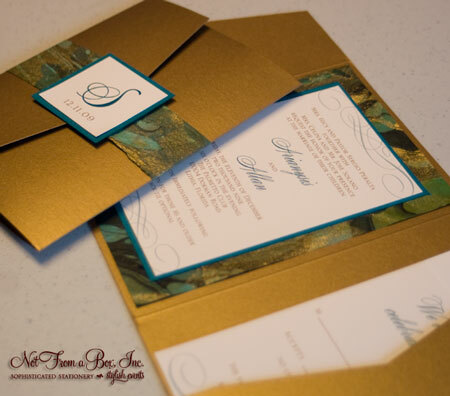 Ari and Allan’s antique gold pocket invitation for their December wedding is accented with a crinkled, hand-marbled paper from Thailand. Thank you Staci with Unique Event Design for the opportunity to work with such creative clients! This entry was posted on October 29, 2009 at 4:49 pm and is filed under Real Weddings & Events, Wedding Invitation Design Ideas. You can follow any responses to this entry through the RSS 2.0 feed. You can leave a response, or trackback from your own site.